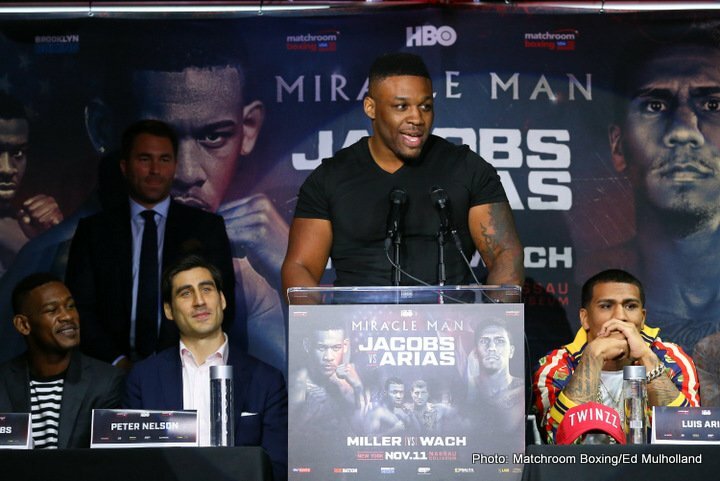 By Allan Fox: Jarrell Miller thinks IBF/WBA heavyweight champion Anthony Joshua is scared of fighting Deontay Wilder, and the proof of that is him turning down $50 million to fight him. Joshua (21-0, 20 KOs) hasn’t turned down the fight with Wilder. He merely said the fight can only happen in the UK. Some boxing fans might see as a tactical way for Joshua to reject the fight against the unbeaten Wilder (40-0, 39 KOs), but it could be Joshua of asserting his A-side privilege by letting him know that the fight can only happen under his terms, even if the money is coming from the Deontay’s side. ”I heard AJs not fighting Deontay for the $50 million. What a sissy,” Miller said to Fighthype. The problem is that if Wilder decides he doesn’t want to agree to fight Joshua in the UK. What happens then? It’s Wilder’s management that is putting up the $50 million offer to Joshua. They’re not doing that for the heck of it. They’re doing it because they want to be in control of the promotion. If they put the money up, they’re not going to let Joshua and his promoter Eddie Hearn have control over the show by staging it in the UK and raking the money in for themselves. Joshua says he’s worried about fighting in the U.S and losing control over the shot. He’s concerned about the judging, which is crazy because the fight is not going to go to the scorecards. Is a sign of Joshua being short-sighted with him not realizing that the odds of the Wilder fight going the distance are almost zero? Joshua has made up his mind that he’s not going to fight Wilder in the U.S, at least for the first fight. The second fight may or may not take place in the U.S. It’ll depend on how Joshua does in the first match. You have to assume that if Joshua loses to Wilder in the UK, he won’t bother going to the U.S to fight him for the rematch, because his career could go down the drain if he goes over there and loses for a second time. Ideally, it would be great if Joshua were to sign a contract stating that the first fight with Wilder will be in the UK and the second one will be in the U.S, but I don’t think he’ll do that. In fact, I fairly certain that Joshua won’t take that risk because if he gets knocked out cold in the UK, he’s going to be a mental wreck going into the rematch with Wilder. If that fight takes place on foreign soil in the USA, Joshua is going to be at the mercy of Wilder. Joshua has had things his own way since his amateur days when he won a questionable gold medal in the 2012 Olympic, which were held in London, England. Fighting in front of his home fans in London, Joshua had 3 controversial wins in that Olympics against Erislandy Savon, Ivan Dychko and Roberto Cammarelle. As a pro, Joshua has never fought outside of the UK. He’s always had the home advantage, even when challenging for a world title. The champion Charles Martin came to the UK to fight Joshua. It’s possible that Joshua is worried about losing to Wilder and having his brand ruined permanently. There’s no doubt that if Joshua were to be sparked out by Wilder in four or five rounds that he’d see his popularity in the UK plummet straight down. The only way Joshua could keep from losing his popularity is to come up with a great excuse that his fans would believe. Excuses after a loss are always bad. Unfortunately, I think Joshua is the type that would be giving excuses after a loss to Wilder or to anybody. I can’t see Joshua giving any of his opponent’s credit if they beat him. He doesn’t seem like the type. ”This guy Joyce, he’s talking a lot of trash after only four fights. First of all, nobody is going to fight you,” Miller said about Joyce. Your company did call. We got a call from Richard Schaefer. They’re not going to put no money up for you because you’re lame. So with that being said, you’re going to have to wait in the back of the bus like everybody else. Earn your shot. Anybody that wants this work and has got some dollar signs, let’s make it happen, because AJ is not going to fight. Joyce ain’t got no money,” Miller said. It’s interesting to see how quickly things have changed with the 29-year-old Miller when it comes to talking about money. In the past before Miller signed on with HBO in a short contract, he would fight almost anyone. But now that he’s tasted some money with HBO, he’s ruling out guys like Joyce for a fight. To be honest, I think HBO would love the idea of Miller fighting Joyce, as that would be far the most interesting fight that he’s had since he turned pro. Miller’s last three fights have come against Johann Duhaupas, Mariusz Wach and Gerald Washington. Joyce would likely beat all three of those guys by knockout. Joyce vs. Miller would give HBO an interesting fight to televise on their network if they could somehow coax ‘Big Baby’ in taking the fight, which I don’t think they’ll be able to do. Miller is likely going to take it easy and fight lower level guys until he gets his payday fight against Anthony Joshua either this year or not. It’s most likely going to happen next year after AJ faces Alexander Povetkin and possibly WBC heavyweight champion Deontay Wilder. Mille will likely make good enough money from the Joshua fight to retire on. Hopefully after that fight, he doesn’t become so picky that he rules out interesting fights that could further his career.